Top Brands for £10 and Under at M and M Direct No need to spend a fortune on your favourite brands! 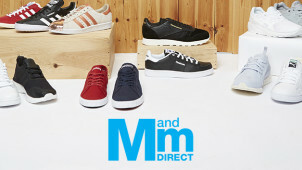 Head to M and M Direct today for fashion and footwear under £10. Over 60% Off Footwear, Clothing and More in the Sale at M and M Direct - Don't Miss! Save lots in the early spring sale at M and M direct. 75% Off Top Brand Orders at M and M Direct - Including Levi's & French Connection Don't be a fool this April, shop this amazing discount with M and M direct. Free Delivery on Orders Over £75 at M and M Direct Simply spend £75 or more at M and M Direct and enjoy your order delivered completely free! 1 Year Unlimited Next Day Delivery for £9.99 at M and M Direct If you're ordering from M and M Direct quite often, make the most of this delivery deal! Discover £35 Off Women's Sportswear at M and M Direct Looking to update your fitness wardrobe this spring? Don't miss out on the savings at M and M Direct. Find £50 Off Women's Clearance Orders at M and M Direct From top brands like adidas, Superdry and Birkenstock. Find £50 off selected orders at M and M Direct. Over 50% Off Selected Men's Designer Jeans at M and M Direct Amazing deal on men's jeans at M and M Direct. Find £40 Off Kids' Sale Orders at M and M Direct In the children's sale at M and M Direct, find over £40 off clothing, footwear, accessories, books and more! MandM Direct is a retail phenomenon, with millions of customers worldwide and the largest market share for outlet fashion in the UK. With prices that can be hard to believe on authentic big brand clothing, accessories and footwear, MandM Direct has legions of fans who keep coming back for more great bargains. Getting more for less at MandM Direct is easy when you keep up to date on the latest deals at vouchercloud – helping you get the best value on all of your favourite brands. Because the deals at MandM Direct are exclusive, and can represent extremely big discounts on highly sought after big brand goods, it can be important to snap up deals as soon as you see them because items can sell out very quickly and as with most outlet retailers, when things are gone, they're gone. Brands you can find at M and M Direct include household names like Emporio Armani, Penguin, French Connection, The North Face, Diesel, Ted Baker and more. With new products being added to their comprehensive categories on the regular - for men, women and kids too - you can shop every bit of your wardrobe and lifestyle with MandM Direct. How Do I Use My M and M Direct discount codes? To make sure that you don't miss a beat on big online sales or events where the best bargains can be had, it's a good idea to sign up for their newsletter, as well as adding MandM Direct to your watched brands at vouchercloud. What payment methods are accepted at MandM Direct? M and M Direct accept all Visa and MasterCard credit and debit cards (including Maestro). They do not accept any online payment systems like PayPal or Skrill. Does MandM Direct offer free delivery? Delivery is free on orders above £75. When you order with MandM Direct, you can choose between standard delivery, which takes 3-5 working days, next day delivery, and nominated day delivery. All of these carry a delivery charge, a list of which you can find here. What size should I order from M and M Direct? Some brands have European sizing rather than UK sizing, but if you are not sure what size to order, you can use the measurement and size conversion charts here on the MandM Direct website. How often is the M and M Direct Black Friday sale? As Black Friday come but once a year - sad times - this will be the same for M and M Direct. Don't be disheartened though as M and M Direct may also have seasonal sales, which you'll hear about when you stay in touch with yours truly. Standard Delivery is free over £75 - arrives in 3-5 working days. Standard Delivery is £4.49 otherwise. Next Day Delivery is available for £5.99 - order by 7pm. Named Day Delivery is also available for £5.99. Items must be returned within 28 working days. Returns are best handled by MyHermes - you can buy a returns label for £1.99. If you love high-end fashion brands and are passionate about getting good deals, M and M Direct is a great place to shop. As an online outlet retailer, they can offer up to 75% off of the RRP on dozens of men’s and womenswear brands. M and M Direct offer some great savings for the summer, so you can get even better value on their great selection of branded clothing when you use an M and M Direct discount code. From men's sandals and trainers to women's sports bras and tops, whatever you need to inspire your summer antics, you can save big and enjoy more when you visit M and M Direct online. M and M Direct is named after its two founders, whose first names both begin with M: Mark Ellis and Martin Churchward. They originally started the business in the late '80s with the idea of making clearance products from big brands more easily available to the public, and as online shopping began to take hold, they were able to grow M and M Direct into one of the biggest designer outlet retailers on the web. As well as branded clothing for men, women and kids, M and M Direct also supplies shoes, boots and trainers for all the family at the same great outlet prices. Get sporty this summer, especially now that you can save even more with an M and M voucher code! Whether you want some classic Converse trainers, some authentic UGG boots, some smart Lacoste shoes or the latest and best Adidas trainers for your sport, you can find them at up to 75% off their original RRP at M and M Direct.